TRC also got a lot of local newspaper coverage with three different papers running stories: The Paw Paw Courier-Leader introduced the project to readers in the watershed, the Watervliet Tri-City Record provided a mid-journey report, and the Herald-Palladium was there with a front page story and photo that coincided with my last leg into Benton Harbor/St. Joseph. �We even got some national coverage when this last article got picked up on Yahoo's national kayak page.� Click the underlined links above to read these articles. The Odyssey was also successful from a fund raising perspective as over $1300 was raised for water quality. �Importantly, I think lots of people have now learned about TRC and that there now exists a voice here in Southwest Michigan for the Black and Paw Paw Rivers. �For those of you who were waiting until the end of the Odyssey to donate, it is not too late! �The Firstgiving site will be up at least through the end of the year. �As always, any donations to TRC for this or other of our programs are very much appreciated. 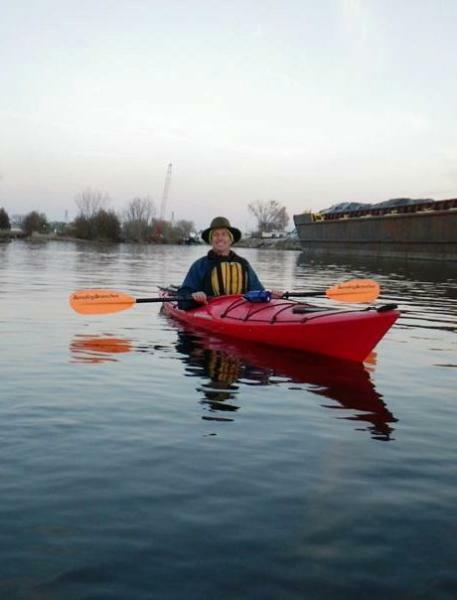 As you may know, the Paw Paw River Odyssey was part of a larger fund raising event called "Walk, Paddle, and Roll" which is sponsored by Freshwater Future. �FwF is a non-profit organization based in Petosky Michigan concerned with water quality throughout the Great Lakes Basin. �FwF helps build effective community-based initiatives to protect and restore the water quality of our region. �FwF provides support and resources to grassroots efforts seeking to accomplish a wide variety of water quality goals. �TRC has been the grateful recipient of several grants from FwF as we have gotten our organization up and running over the past 2 years. �You can learn more about FwF at http://www.freshwaterfuture.org/.� Many thanks to our friends at Freshwater Future! Most important, I re-learned what I had already known but kind of forgot: The Paw Paw is a tremendous natural resource right here in our own backyard. �The forested floodplain that the river flows through still performs all the essential wetland functions. �It retains and absorbs water when the river floods and then slowly releases it back. �It filters sediment and toxins out of the water. �It provides critical habitat that is so important as development threatens rural SW Michigan.� Paddling the entire navigable portion of the river over a time span of 11 weeks allowed me to see the river differently and with a continuity that you miss if you just know the Paw Paw from driving over it on a bridge. �It is beautiful, some of it is wild, and it is a treasure to be cherished and protected. The Odyssey was always a team effort and I want to thank some of the key players. �Dave Foerster [President of TRC] spent countless hours turning my emails into blog content, rescuing my video clips from YouTube , and sending out mass emails. �Matt Meersman [Treasurer of TRC] kept coming up with new colors as he traced my progress on the map on the website. �Marcy Colclough [Southwest Michigan Planning Commission] helped spread the word on TRC's Facebook page and then turned my pictures into a great Powerpoint presentation [stay tuned, there may be a showing in your neighborhood in the near future!� Ask if you are interested.]. �Kenneth Nesbitt [Paddler extraordinaire and recently elected TRC Board member] accompanied me on most segments and, along with his friends, helped clear a paddle route that allows for days of beautiful paddling. �Mindy Russell-Haight [my wife] ferried me around every week-end dropping me and my trusty kayak [a Tsunami 125 ] off at various locations, then spotting my car downstream. �Finally, let me thank once again all the people who donated to the fund raising effort. Those donations are very much appreciated and will be dedicated to helping achieve the mission of TRC, i.e., working to protect the health of the Black River and Paw Paw River Watersheds through conservation, education, and advocacy. This page last updated on 1/16/2011. The�66�mile journey down the Paw Paw river�to raise awarenes of local water quality issues and to raise funds for local conservation�has ended�at the confluence of the Paw Paw River with the St. Joseph River in Benton Harbor.� Thank you for the interest in my project.� If my reports have heightened your appreciation of this local treasure, that which is the Paw Paw River, then I am pleased.� If I have also entertained you along the way, then I am�doubly pleased.� If you wish to throw something in the hat,�contributions are still being accepted here.� Absolutely any amount is welcome;�all contributions are tax deductible.